In partnership with Politecnico di Milano School of Management and the ASEF University Alumni Network (ASEFUAN), ASEF organised the Model ASEM 2014 on 8-12 October 2014 in Milan, Italy. This was the 6th edition of Model ASEM, which simulates the Asia-Europe Meeting (ASEM) for students to exercise their skills in multilateral negotiations and diplomacy. Through a widely distributed Open Call, ASEF received more than 1,700 applications from Asia and Europe and succeeded in selecting 120 students representing all ASEM member countries. Model ASEM started with in-depth online preparations by the students on the ASEM process and issues prior to the actual meeting. Keynote speakers at the meeting included Sen. Benedetto DELLA VEDOVA Under Secretary of State, Italian Ministry of Foreign Affairs; and Mr Brian TOLL, Policy Coordinator for Asia, Directorate-General for Education and Culture, European Commission. Mr Michael MATTHIESSEN, ASEF’s Governor for the EU and Alternate ASEM Senior Official, presented the ASEM process and its achievements. A key result of Model ASEM was the development of a Chair’s Statement, similar to the ASEM Summit, which captured the discussions and agreements during the plenary sessions and working groups. In the evaluation after the meeting, the participants expressed that this exercise helped them to improve their skills in public speaking, negotiation and consensus-building as well as intercultural communication. The main highlight of Model ASEM was the direct engagement of students with the ASEM Leaders. Four student delegates had the honour to personally hand over the Chair’s Statement of Model ASEM 2014 to H.E Herman VAN ROMPUY, President of the European Council and H.E José Manuel BARROSO, President of the European Commission, prior to the 10th ASEM Summit. After the meeting, H.E. VAN ROMPUY twittered “Future of Asia-Europe relations in hands of today's youth. #ModelASEM helps young Asians & Europeans shape it” and shared a video of the interaction on his official Youtube channel. Furthermore, several students received invitations by their respective Leaders to meet and share their experiences of Model ASEM, including H.E. Joseph MUSCAT, Prime Minister of Malta, H.E. Didier BURKHALTER, President of Switzerland and Mr Syed Tariq FATEMI, Special Assistant to Prime Minister of Pakistan. These meetings showcased the commitment by ASEM Leaders to engage the youth in the ASEM process. The valuable results of Model ASEM 2014 have also been acknowledged in the Chair’s Statement of the 6th ASEM Culture Ministers Meeting that took place 18-21 October 2014 in Rotterdam, the Netherlands. Spin-off activities of the Model ASEM simulation are planned to be held in France, the Netherlands, Singapore and Viet Nam in 2015 and 2016. Following the success of Model ASEM 2014 last October in Milan, Italy, where students from 51 ASEM member countries met in conjunction with the 10th ASEM Leaders’ Summit (ASEM10), the 1st edition of the Model ASEM spin-off activities will kick-start in April 2015 in Singapore. Organised by the newly established ASEM Young Leaders Network based in Singapore and supported by the Asia-Europe Foundation (ASEF), Model ASEM Singapore 2015 will take place on 10-12 April 2015 at the National University of Singapore (NUS) and brings together about 150 local and international students. Model ASEM is a 3-day simulation of the actual ASEM Summit to generate interest and increase awareness of the ASEM process among university students. While Model ASEM is held alongside the actual ASEM Summit every two years alternating in Asia or in Europe, the spin-off activities are organised locally to capture the enthusiasm of the students’ interest at a broader level. The structure and programme of Model ASEM Singapore 2015 will closely follow the actual proceedings of the ASEM Summit and conclude in a joint Model ASEM Singapore Chair’s Statement. Through this political simulation exercise, participants will have the opportunity to sharpen their negotiation, diplomacy and consensus-building skills in Plenary Sessions and Working Groups with a focus on economic, political and socio-cultural issues. Similar to Model ASEM 2014, the student delegates will also visit Embassies of ASEM member countries in Singapore in order to gain first-hand knowledge of the activities of diplomatic missions. Further spin-offs of Model ASEM are planned to take place in other ASEM countries including Finland, France and Viet Nam, amongst others. More than 120 students, representing all 49 Asia-Europe Meeting (ASEM) countries, met on 8-12 October 2014 in Milan, Italy, for Model ASEM 2014, a 4-day intensive and rewarding simulation of the 10th ASEM Summit. The Model ASEM 2014 participants jointly developed key messages for the ASEM Leaders’ attention and action. 4 selected students from Italy, Indonesia, Malta and Pakistan officially handed over the Chair’s Statement of Model ASEM 2014 to the President of the European Council, H.E. 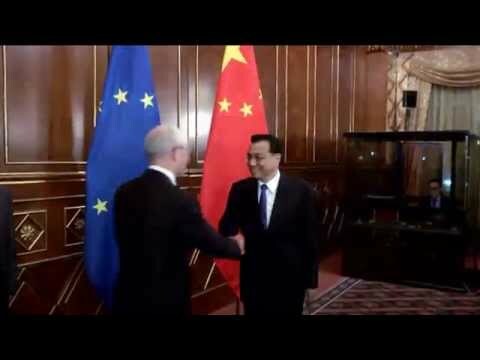 Herman Van Rompuy, and to the President of the European Commission, H.E. Jose Manuel Barroso. During the 45-minute interaction with the EU leaders, the student representatives emphasized the importance for ASEM governments to consider “development” in a more holistic way. They also called for a wider participation and stronger engagement of the youth in the ASEM process. In particular, the students proposed the creation of an annual ASEM Youth Summit to foster human connectivity between both regions. More than 130 students from 49 ASEM countries will gather from 8–12 October 2014 in Milan, Italy to participate in the Model ASEM 2014, a simulation of the 10th ASEM Summit (ASEM10). The participants have been selected from more than 1,700 applications. Model ASEM 2014 will offer these students the opportunity to deliberate on pertinent issues in Asia-Europe cooperation, including climate change mitigation, economic growth, education and skills development, pandemic influenza and more. By exploring national and regional strategies, the students will formulate policy recommendations to address crucial political, economic and socio-cultural issues in both regions. As part of the programme, student delegates will visit Consulates of ASEM member states in Milan, where they will witness first-hand the roles and various activities of diplomatic missions. The participants will develop their skills in diplomacy, negotiation and public speaking. The conference will conclude with a joint Model ASEM Declaration, which ASEF will channel to ASEM leaders and their delegations at ASEM10. Model ASEM 2014 is organised by the Asia-Europe Foundation (ASEF), together with the ASEF University Alumni Network (ASEFUAN) and the Politecnico de Milano School of Management. Model ASEM 2014 application is now open! Extended deadline to 1 September for students with residence in Italy only. If you are a student interested in connecting with students from 49 countries in Asia and Europe, we invite you to join us in Milan, Italy on 8-11 October 2014. You will participate in political debate, increase your skills in consensus-building and share your vision about Asia-Europe collaboration. For further information on Model ASEM, click here.